Have taken Cell Forte MAX3 by Enzymatic Therapy for years for immunity with good results. 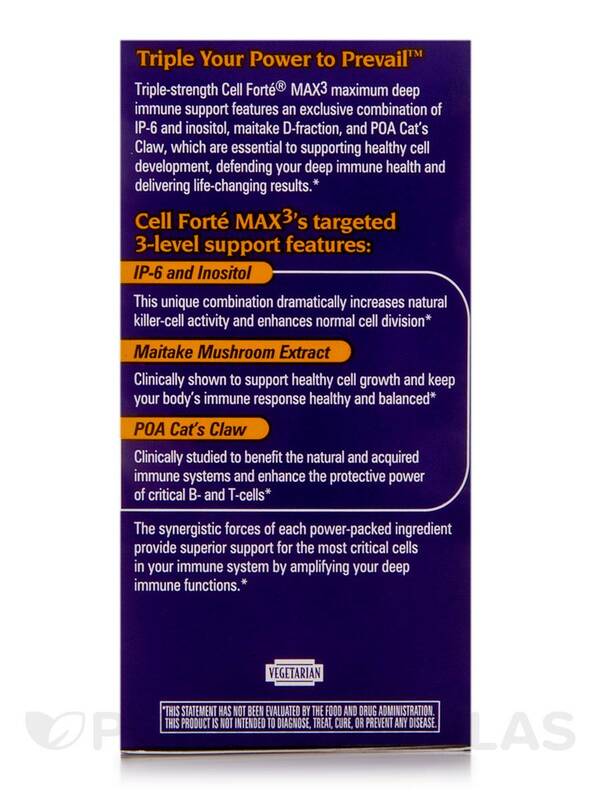 Cell Forte MAX3 is manufactured by Enzymatic Therapy to activate the functions of the immune system. Cell Forte MAX 3 activates the body’s natural defenses. IP-6 acts as a potent antioxidant that fights free radicals. Free radicals cause damage to cells. 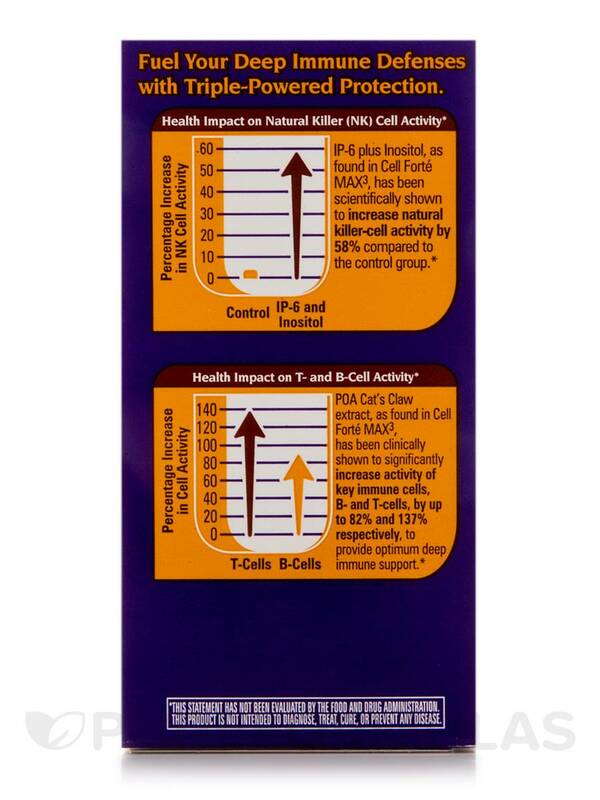 IP-6 helps boost the activity of cells that fight infection‚ and helps maintain normal cell growth. The use of Inositol can prevent the formation of harmful cells in the body. Inositol may also reduce cholesterol levels. Maitake Mushroom and POA Cat’s Claw both have the ability to stimulate the body’s natural immunity. 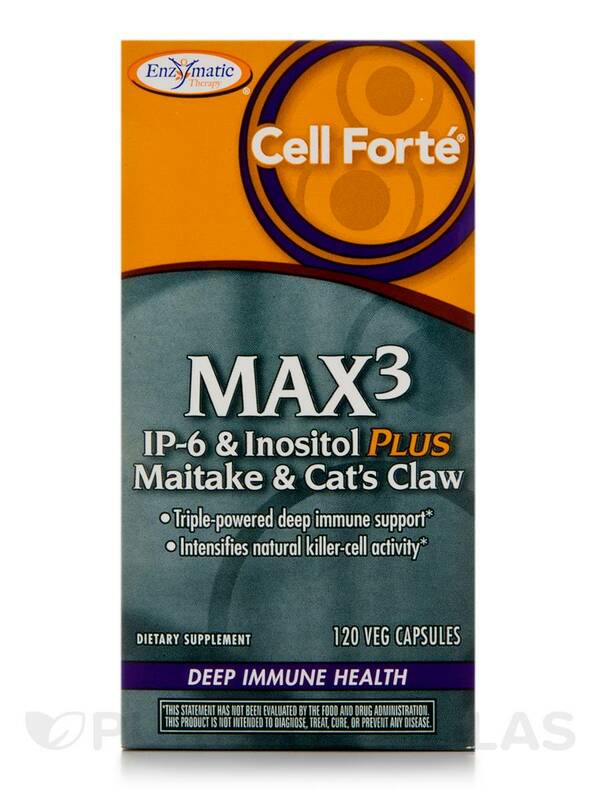 Cell Forte MAX3 is ideal for people who want to improve the health of their immune system. Two capsules twice daily for maintenance. Best taken on an empty stomach. For maximum support‚ up to 16 capsules may be taken per day. 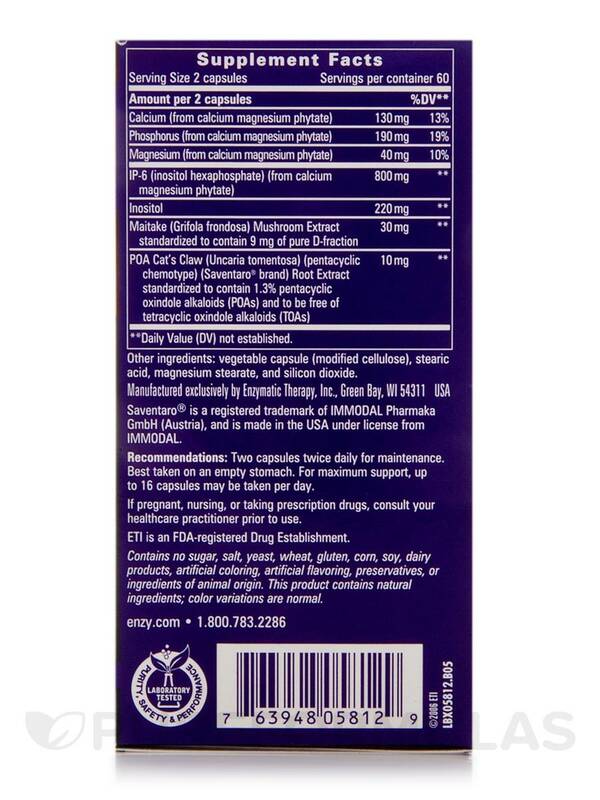 Other Ingredients: vegetable capsule (modified cellulose)‚ stearic acid‚ and magnesium stearate‚ and silicon dioxide. Larger capsule then I would prefer, and must take on empty stomach. In February 2015, our vet suggested our older redbone coonhound might have cancer in her lymph nodes (she had successful surgery for a malignant mammary gland tumor last fall). We decided not to have chemo treatments but went to our local herb store. It was suggested by the store owner that we give Maizy Grace Cell Forte MAX3 by Enzymatic Therapy (6 capsules/day; she weighs 80 lbs) and a vitamin C supplement. After just a week or so, we noticed our beloved dog acting more youthful and energetic than ever before! Despite the fact our vet thought she might have just 3 months to live, she is still living a happy, active life! To be fair, we are not certain she has cancer again. We opted to just enjoy every day she has and to try to keep her as healthy as possible for as long as possible without putting her through treatments. I also rub frankincense essential oil on her mammary glands every day. I truly believe the MAX3 is helping her to have a longer, healthier life. She runs like a younger dog and has a great appetite. I just ordered two more bottles today! I like Cell Forte MAX3 by Enzymatic Therapy. I Really enjoyed the great service and free shipping.